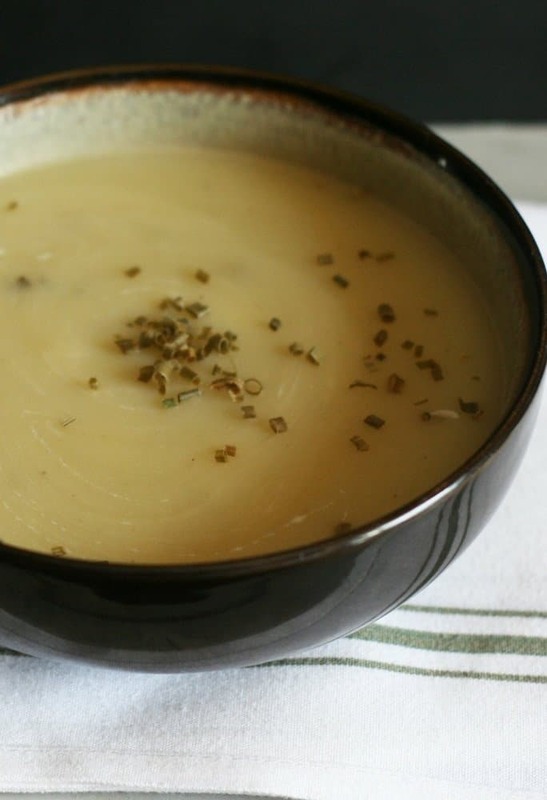 Low-fat potato leek soup is full of flavor and low in calories! A hearty soup to warm up with and full of veggies! This is a great soup for any night and also great for a Holiday meal! Creamy potato soup without any cream and extra calories! A vegetarian/vegan soup which is also gluten-free to keep your diet in check! One of my favorite soups is potato leek soup! I know you are thinking cream, which leads to lots of fat! Well, don’t you worry, this soup does not have any cream. 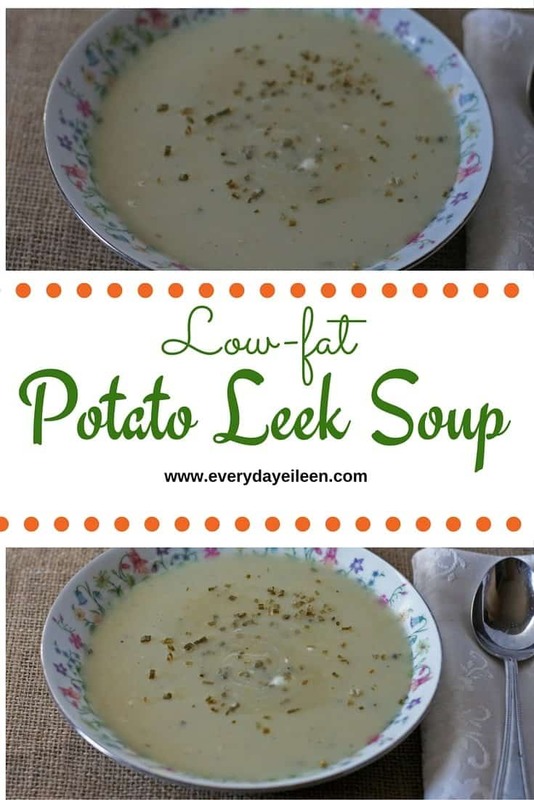 This is a low-fat potato leek soup! The soup gets its creaminess from pureeing the soup once all the veggies are tender. Super yum and you get to eat a low-fat soup that is ever so tasty! You will seriously not miss the cream and quite frankly, I rarely use cream and no one is complaining! I have been fighting the flu for quite a while now! I think I need to give in and see my doctor! Between the snow and cold temperatures, I just cannot shake being cold. One thing I can say about this time of year is, you guessed it, soup! I crave it all winter! I love any kind of soup, creamy, clear, veggie, or meaty, not sure if meaty is a word, but you know what I mean! At least I think you do! I believe my cold medicine is kicking in! The potatoes, I love to use Idaho potatoes for this soup, but if you prefer red or Yukon potatoes, enjoy! I won’t hold it against you! Lumpy or smooth you ask, I am talking about soup in case there is any confusion! I prefer a smooth soup, that is just my personal preference! We will still be friends if you like a few larger pieces of potato in the soup. Just puree half of the soup! It is all delicious! Leeks, please make sure when you prepare your leeks, you wash them very well. If they have a lot of, well there is no other way to say it, dirt, in the stems soak the leeks in a bowl of water to get rid of excess dirt! This soup freezes really well, so why not make a double batch. For smaller amounts, put in individual freezer containers! 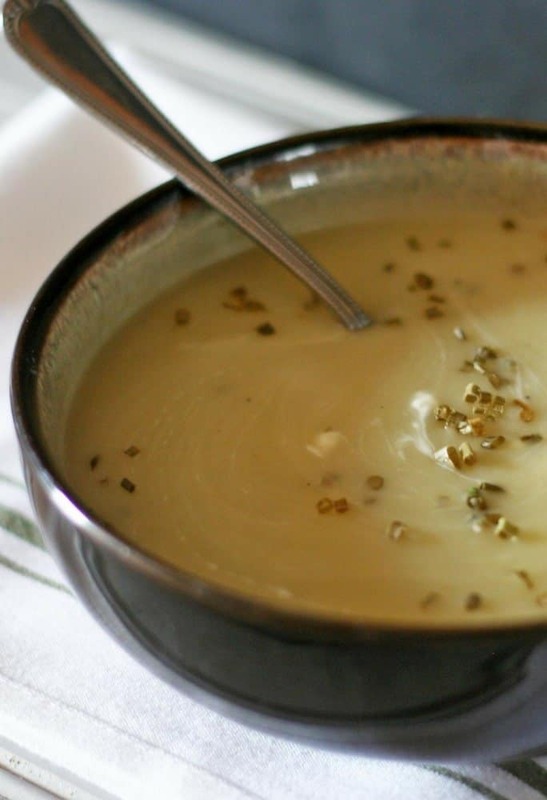 I hope you add this healthy potato soup to your HEALTHY SOUPS/HOLIDAY SOUPS PINTEREST BOARDS! I’d love for you to follow me on PINTEREST! I’m always pinning from talented and amazing bloggers! 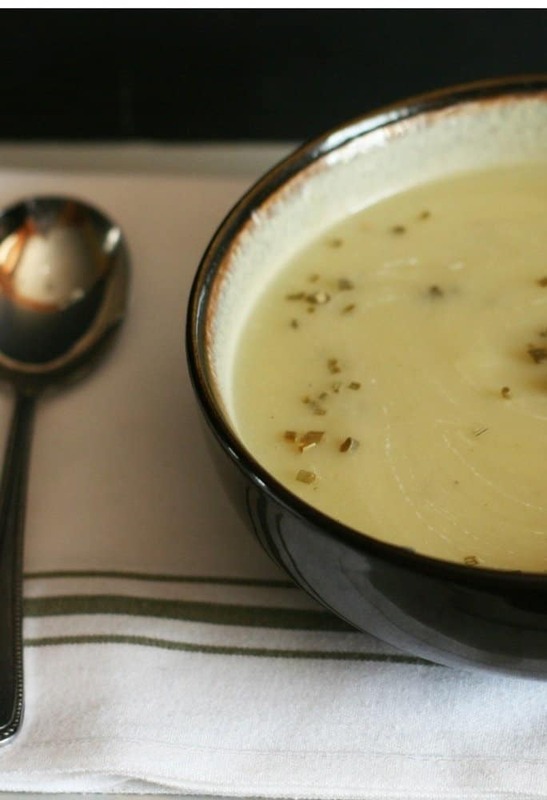 I’d love for everyone to make this tasty creamy Potato Leek Soup! I’d love to hear how you enjoyed the recipe! It’s always great when you share your recipe on Instagram! Use #everydayeileen, so I can see and share your recipes! Please share the love on Facebook or your favorite way of relating to your friends and family! Please continue connecting with me on other social media, Twitter, Bloglovin, Google Plus ! Feel free to subscribe to my newsletter to never miss a recipe! Thank you for the continued support! I am forever grateful to you all! A low-fat Potato and Leek soup. The soup gets its creaminess from pureeing the soup when the vegetables are tender. Tasty and low-calorie. Soup freezes well! In a large dutch oven or stockpot, over medium heat, melt the unsalted butter. Add the leeks and onion. Saute for about 5 minutes to soften the vegetables. Add the potatoes and the vegetable stock. Cover, let simmer, for about 30 - 35 minutes. Check potatoes for tenderness. Ok I am pinning this. I LOVE soups! Makes my day! Glad you are pinning! Thank you Angie. This is a go to comfy food for my family! I am glad you will be making this, enjoy! I haven’t made Potato – Leek Soup in years! You’ve inspired me to make it again! This makes my day! Let me know when you make it! I hope you try making this. Super easy and delicious! old room mate! He always kept talking about this. I will forward this article to him. I hope you enjoy making this soup! I love getting new recipe ideas like this. Thanks for sharing. My son will really love this. I hope you and your son enjoy this soup! This is a great recipe. Another one to add to my list of foods to try. You are very welcome! I hope you give this a try soon! This sounds (and looks) like a great new soup to add to my recipes! I love a good soup especially during the cold winter months in Maine! We’ll be staying indoors this weekend while the temps are below zero for a high! This would be a great meal to make…gotta run out and get some leeks! Oh, I am thrilled you will be making this soup. Let me know how it tasted! I’m always looking for a new soup to try in winter. This looks yummy and filling on a cold day in Ohio! I only need to purchase leeks and I can make it this weekend! I hope you enjoy making this soup. Let me know how it comes out for you! Yum, yum yum! I love blended soups! I’m definitely going to need to get my fiance to make this soon (he’s a chef and doesn’t usually let me in the kitchen lol)! That is funny Shaylee! I hope your fiance makes this for you too! That is great. Let me know how the recipe came out for you! That looks tasty and I love that it’s low fat. Thanks for sharing the recipe. I try to keep as many things low in fat, so an occasional treat is okay too! Love your recipe! my husband will love it, he really likes leeks. 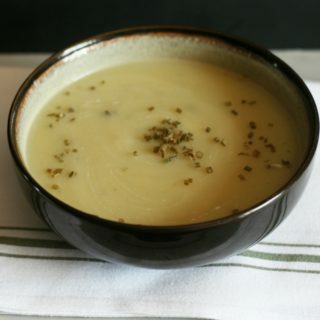 Leek and potato soup is one of my faves can’t wait to try yours out! Seems so yummy! I should make this soup! Thank you for sharing the recipe! I hope you try it and enjoy! I love leeks so much! This sounds like a delicious soup!! Potato and leek make for a delicious winter soup. Your recipe looks so delicious. I tried making potato soup once and it didn’t turn out too well. Maybe with this recipe I might have better luck. I will let you know. Please do Claudette. This one is delicious! I am so glad to inspirate you! Let me know if you make it! Tara, I use either home made stock or low-sodium. I also usually put salt to taste. I have very high blood pressure and I am so super salt sensitive. I hope you and your family enjoy! Potatoes are awesome because it absorbs flavor well and goes great with different ingredients. It’s nice to make a soup out of it too. Perfect for the cold weather! That sounds really tasty! I can’t wait to try your recipe. I love soup during the winter, and I especially love potato soup. I may have to try this recipe. Potato soup is one of my favorites! Been forever since I’ve made my own though – this looks good enough to try! Well I hope you do! Its delicious! I have never made a potato leek soup as I don’t like the cream. Thanks for introducing a lower fat version. I am so glad. let me know how it comes out. I love this one!